The Moon Dance is the culmination of our Bridge to Nature campaign to raise $250,000 to bring nature connection programs to the students with the greatest needs within Santa Barbara’s public elementary schools. 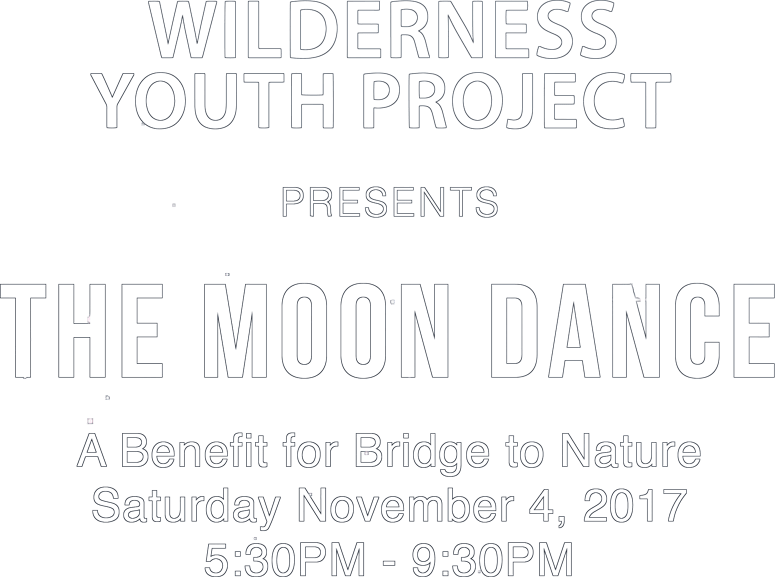 Wilderness Youth Project invites you to join us on Saturday, November 4th, for a marvelous night for a moon dance, to support and celebrate our Bridge to Nature Campaign. The Moon Dance will be a magical outdoor evening with live music, a contra dance caller, local beer and wine, wood-fired pizza, and great company. Join the WYP community at Imagine Park on Cathedral Oaks Road set in the natural beauty of mature oaks, fruit trees, gardens, and meandering pathways. So put on your dancing shoes! It’s guaranteed to be a special evening under the moon and stars. This evening will be the keystone of our Bridge to Nature Campaign, which will bring Wilderness Youth Project into the school day for the students with the greatest needs in our community. Your purchase of a Moon Dance ticket will be matched dollar-for-dollar by a generous sponsor to help us reach our goal of $250,000. We hope you’ll join us. Become a Bridge Builder by signing on as a Moon Dance Sponsor! The Moon Dance is the culmination of our Bridge to Nature campaign to raise $250,000 to bring nature connection programs to students with the greatest needs within Santa Barbara’s public elementary schools. We need to fill the following sponsor spots, so sign up now.